Happy Halloween to you all. Lately there has been talk to “reboot” Ghostbusters with an all female ghost hunting team. 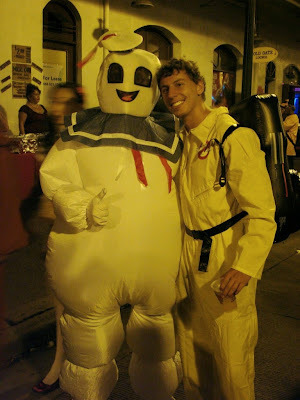 So its perfect to pull this photo from Waikiki of a ghostbuster and the infamous Stay Puft Marshmallow Man. I hope you all have a safe and Happy Halloween. 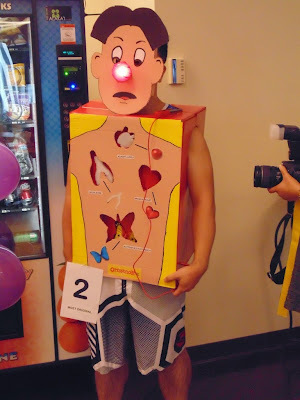 Time to kick off Halloween with this “Operation” costume. I remember playing that game as a kid and trying to pull the bones and organs out without touching the sides and lighting up the nose. Truly a classic game and an epic costume. For the next few days we will be looking at Halloween in Hawaii. Out in Wahiawa is a family owned and managed southern restaurant called Molly’s Smokehouse. Their food is 100% cooked with wood, no chemicals and no boiling or baking. 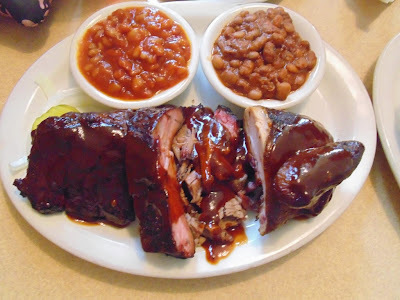 Here is the Molly’s Supreme Combination with beef brisket, chicken and ribs and the cowboy and baked beans. It was a delicious meal topped off with some southern sweet tea.